Hi, here's my first article, with a jpeg diagram/picture. 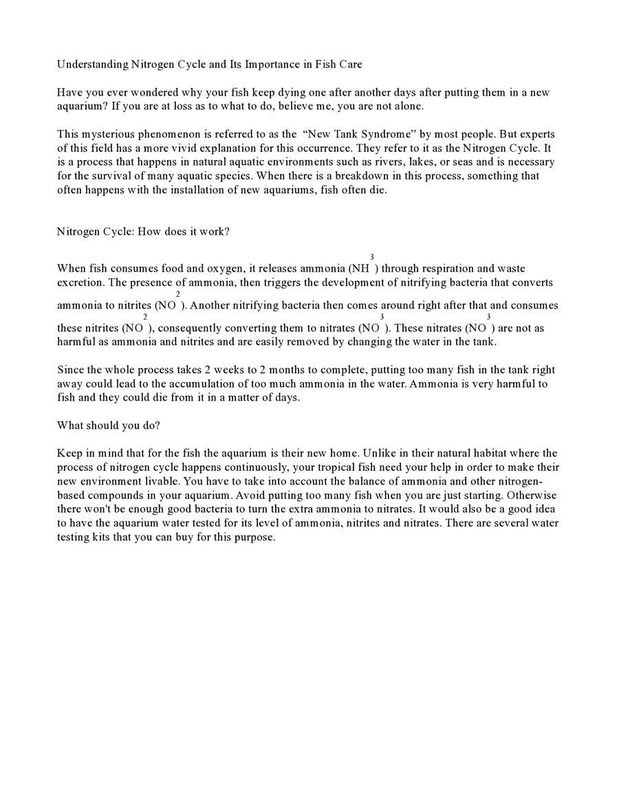 It's a 376-word article about the Nitrogen Cycle and why the lack of knowledge about it keeps new fish pet owners confused as to why their fish suddenly die. I have also included screenshots of the article's plagiarism check (http://smallseotools.com/plagiarism-checker/). It's 100% unique content. Thanks, and have a nice day. As I was in a hurry to submit the article, I didn't see a few grammar mistakes. like it's "at a loss" not "at loss" and "have a more vivid explanation", not "has" to agree to the plural subject "experts". No problem, I've made the necessary corrections on the DOC file. Thanks - this is exactly the sort of thing I'm looking for.